When Must An Automobile Insurer Pursue Reimbursement for Medical Payments? In Holland v. Indiana Farm Bureau Insurance Company, the Indiana Court of Appeals decided a dispute between an Indiana lawyer and an automobile insurer concerning the reimbursement of medical payments coverage provided by the automobile insurer to the injured client of the lawyer in a personal injury lawsuit. After the lawyer’s client was injured in a vehicle collision and sustained medical bills as a result of injuries suffered in the collision, the client’s automobile insurer paid $5,000.00 towards the client’s medical bills. The automobile insurer put the attorney on notice of its subrogation claim, which entitled it to partial reimbursement of the amount it paid out of its medical payments coverage. Under Indiana law, the amount of an automobile insurer’s subrogation claim for medical expenses paid on behalf of an injured party is diminished in the same proportion as a personal injury claimant’s recovery is diminished by comparative fault, or by reason of the uncollectability of the full value of the claim for personal injuries or death resulting from limited liability insurance. Ind. Code § 34-51-2-19. The amount of the automobile insurer’s subrogation claim is also reduced by a pro-rata share of the claimant’s attorney’s fees and litigation expenses. Id. In this case, the personal injury lawsuit against the at-fault party was settled in the client’s favor. The client’s attorney and the automobile insurer were unable to reach an agreement as to the reimbursement amount due the automobile insurer from the personal injury settlement. More than two (2) years after the Indiana attorney and the automobile insurer reached an impasse and communication ceased between them concerning the medical payments subrogation lien, the automobile insurer filed a lawsuit in state court in Indiana against the Indiana attorney. While the trial court initially found in favor of the automobile insurer, the Indiana attorney appealed the decision, and the Indiana Court of Appeals reversed the decision of the trial court, finding in favor of the Indiana attorney based upon a two (2) year statute of limitations for breach of fiduciary duty. Can You Be Found Negligent for Extending a Courtesy Wave? You are sitting in a growing line of cars at a traffic light waiting to make a right turn onto the Lloyd Expressway. Up ahead at the exit of a parking lot sits a vehicle with a frowning senior citizen who apparently wants to make it across your lane into the left lane. You recall how you felt the last time you were stuck in traffic and unable to move and someone waved you out. You decide to return the favor and stop, leaving room for the vehicle to cross your lane. You look in your rear-view mirror to make sure no traffic is approaching in the left lane, smile and kindly signal the driver to go. Out of nowhere comes a speeding truck. Horns honk, and brakes squeal. Your heart races. If the cars collide, could you be found negligent for having given the courtesy wave? In Key v. Hamilton, the Indiana Court of Appeals explored this legal issue. Hamilton was seriously injured when his motorcycle struck a vehicle Key had waved through traffic. The trial court ruled that Key owed Hamilton a duty, determining that a jury should be allowed to decide whether Key had been negligent in extending a courtesy wave. The jury returned a verdict in Hamilton’s favor, finding Key was 45% at fault, the driver who Hamilton had waved through 50% at fault, and Hamilton 5% at fault. The jury found Hamilton’s damages to be $2.2 million and reduced this award after applying Indiana’s Comparative Fault Act to $990,000, entering judgment against Hamilton. Hamilton appealed. 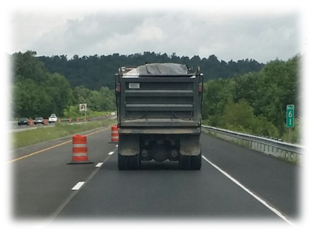 At one time or another, most drivers have been passed by or stuck behind a large truck hauling a trailer enclosed by a loose tarp or an open bed of rock, gravel or rip-rap. Oftentimes, the truck has a sign that reads, “NOT RESPONSIBLE FOR BROKEN WINDSHIELDS,” suggesting such vehicles are protected from the harm they may cause on the roadway. Not true. Commercial truck drivers have a duty to ensure the safety of their cargo and equipment. Federal regulations provide that commercial truck drivers must perform a safety inspection. No shipper can force a driver to accept a load the driver believes is unsafe. Nonetheless, a shipper may face liability if a defect in the load could not be uncovered by the driver through ordinary observation. Careless loading and hauling of cargo and equipment can cause chipped paint, dents and broken windshields. However, sometimes serious and catastrophic injuries and even death can occur when a a vehicle is struck by unsecured cargo or equipment, such as a crane boom, or must leave the road to avoid such dangers. Because many companies and their insurers will seek to shift the blame to the victim for purportedly following too closely or not taking equally dangerous evasive maneuvers, the only recourse in such situations may be to seek a legal remedy. Not every car accident can be cut and dry to assess. In fact, many multi-vehicle car accidents can be difficult to sort out and assign any kind of culpability. One car accident in Indiana is currently being investigated as there were six vehicles involved. The multi-vehicle accident happened around 6:30 p.m. on a Saturday evening. According to an initial assessment of the accident, a pickup truck was westbound and hit several cars that were at an intersection. Then, the same pickup truck is believed to have hit another vehicle that was southbound at the time, although there is no word for sure as to what exactly unfolded. Authorities said a van was pushed over a curb and a red pickup truck was in the center of the intersection when the incident was assessed. Two vehicles were also said to be smashed together in front of a service station. The crash in being investigated, and four people were injured in the melee. There was no word as to exact nature or severity of any injuries suffered. When a driver runs a red light and smashes into another vehicle, the consequences can be far-reaching and life-altering for those in that driver’s path. This scenario is the cause of the many car accidents in Indiana. One such accident recently resulted in a man suffering critical injuries. The accident occurred on a Sunday night as a man drove a Hummer through a red light. His vehicle struck another vehicle operated by a 32-year-old man. The victim suffered critical injuries as his vehicle was pushed into a ditch, causing him to be trapped in his vehicle until help arrived at the scene. The driver of the Hummer left the scene. Witnesses said the Hummer was going roughly 80 mph. Police are currently working to track down the owner of the vehicle. The family of the man who was seriously injured have stated it hopes someone with information comes forward. The sheer force and unexpected nature of a head-on car accident can leave devastating consequences behind for the injured and for the family of victims who die as a result. Head-on car accidents in Indiana in particular are responsible for countless injuries and can be deadly for innocent victims. One recent head-on car accident took the life of a 57-year-old innocent driver. The accident occurred on a Sunday night, roughly around 9:30 p.m. A 61-year-old man was driving north on the highway. For some reason, his car drove left of the center line and hit another vehicle head-on. That vehicle was driven by the 57-year-old woman. That woman was pronounced dead at the scene of the accident. The man who hit her vehicle was air lifted from the crash. He was being treated for serious injuries. There is currently an investigation into the accident, but police indicate they do not yet know if alcohol or drugs played a role in the car accident. A collision between any two vehicles on a busy roadway can obviously lead to injuries or worse. When those car accidents involve motorcycles, the drivers and passengers on those motorcycles can be at a greater risk for serious injury or death. A recent collision between a car and a motorcycle on an Indiana roadway led to the death of the motorcyclist and injuries for his passenger. The accident occurred just after noon on a Sunday. A 44-year-old man and his 32-year-old passenger were hit by a Pontiac. According to reports, the Pontiac driver was about to make a left turn onto another road. Then, that driver apparently pulled back into traffic upon realizing it was the wrong road; this lead to the collision. The 44-year-old motorcyclist died at the scene of the accident. The passenger was transported to a medical facility by helicopter. The driver who hit the motorcycle suffered cuts on his hands and needed medical treatment also. Many motor vehicle accidents occur in or near Indiana intersections. When these types of car accidents involve motorcycles, those riding on a motorcycle typically suffer the most serious injuries. Recently, a car and motorcycle collided in an intersection in Noblesville. Several people were injured, including the motorcyclist. The accident happened as a passenger car was headed westbound. That vehicle apparently pulled out in front of a motorcycle that was headed southbound. The collision occurred around 11 p.m. The intersection is regulated by stop signs on one road and none for the other road. The Honda was traveling on the stretch of road that contains the stop signs. The motorcyclist was taken by ambulance to a nearby medical facility. That individual was reported to be in critical condition. The 18-year-old Honda driver was also transported by ambulance for treatment of injuries. Two passengers needed medical treatment; one was transported for care and another was treated and released at the scene of the accident. Authorities have said they are unable to rule out intoxication as a possible factor in the car accident. As motorcyclists throughout the state of Indiana begin to get their motorcycles out of storage for the season, it is a good time to revisit the subject of motorcycle safety. The weapons safety manager and motorcycle program coordinator for 434th Air Refueling Wing, recently shared risk management tips communicated to members of the Air Force regarding riding safely. The first thing he recommends is conducting preventative maintenance inspection. While it is always a good idea to do this before heading out or a ride, it is particularly important when it has not been used for a period of time—such as during winter. Cables, mirrors, fluid levels, chain, brakes turn signals and lights should all be inspected both visually as well as operationally. Next, riders should keep in mind that road conditions may have changed as a result of the winter. The cold temperatures can lead to pot holes and salt and sand may still be on the road. All of these factors can make travelling on these roads more perilous for motorcyclists. Spring has sprung in Indiana, and few are more excited about the nice weather than motorcyclists are. That bike may have sat idly in the garage all winter, but it’s time to get out and ride. Living in a state with cold winters isn’t just an inconvenience for motorcyclists. It also makes the riding season more dangerous. Some motorcyclists get out of practice, and just as importantly, drivers of cars and trucks forget to keep an eye out for riders that they haven’t seen all winter. The National Highway Traffic Safety Administration notes that across the United States, 62 percent of fatal motorcycle accidents occur between May and September. Perhaps it is fitting, then, that May has been designated Motorcycle Safety and Awareness Month in Indiana and other states. Various events and educational campaigns will be held throughout the month to prepare all motorists for the months ahead.